We probably already have the technology to find evidence of extra-terrestrial life forms and to even send out evidence of our own. If we don’t have this capability yet, we certainly will have achieved it within twenty years! 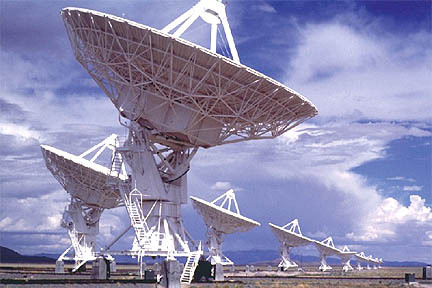 That article enumerates the reasons that guarantee failure in existing SETI projects. But that failure does NOT mean that extra-terrestrial life and intelligence does not exist! It just means that we must approach the subject from a different direction. Speculate with me for a moment about the future for the Earth. Let’s say that all governments start to cooperate and that Peace generally rules the Earth (RIGHT!!!) Say, further, that the leadership of these collected societies have curiosity about distant planets and stars. They are aware of the astounding distances between these objects. They know that sending a crew in a spaceship to even the nearest star would either take centuries or take phenomenal amounts of energy to accelerate the spaceship to near the speed of light and then decelerate it again, or both. As an interesting aside, no science fiction stories, TV programs or movies ever address this acceleration/deceleration issue. If the Enterprise could GO Warp 6 or whatever is one thing. When Captain Picard says “Engage!” everyone in the ship would necessarily be thrown against the rear walls of whatever rooms they were in! Even if the ship only accelerated at a modest 2 Gs, the ship would accelerate, but Newton’s Laws tell us that anything not bolted down would NOT! Like people within it! And at that moderately uncomfortable 2 Gs of acceleration, continuously, for a full MONTH, the ship would STILL not even be going 1/10 the speed of light! During that month, every 200 pound man on board would struggle around as though his body was weighing 400 pounds! Their hearts would constantly be struggling to pump blood up to their brains, because that chore would also be around twice as difficult because of the constant 2 Gs of acceleration. In nearly every physiological sense, they WOULD each weigh 400 pounds during that month of acceleration. Einstein’s findings clearly establish that there is no way around this problem, which is technically referred to as “inertial mass”. And the month of DECELERATION, to slow back down, would ALSO cause all the people on board to experience the 2 Gs of acceleration, so they would again effectively weigh double their normal body weights! The medical doctors on board would be busy! The number of heart attacks and strokes would certainly be very high during those periods of acceleration and deceleration! And this is only considering 2 Gs. Momentarily, a human can withstand accelerations of more than 4 Gs, but without a special “G-suit”, the blood that is in the legs and feet cannot be pumped back up, the heart is just not strong enough. Many early jet test pilots died because this was not known then. Without a blood supply to the brain, the pilot would pass out within a few seconds, and the test aircraft would go out of control and crash. So, even considering anything higher than 2 Gs is too dangerous (for humans) to even consider. Granted, if our hypothetical spacecraft ever actually got up to the resultant 15,000 miles/second speed after that month at 2 Gs, and stopped further acceleration, everything would be fine! The people on board would not even have any sense of moving. Einstein proved that, too, and called it “relativity”. The problem here is in the accelerations and decelerations necessary to change the speeds. Keep in mind that our space travelers had to be subjected to the 2 Gs acceleration, day and night, for a month, just to get up to slightly less than 1/10 the speed of light. At that (relatively slow) speed, any possible benefit from “warp” effects, of time slowing down (technically called time dilation) would be negligible. In order to actually benefit from that effect, more than a year of 2 Gs acceleration would be necessary, to get the ship up to a large enough fraction of the speed of light to start having a significant effect. In addition to this, IF such a spaceship could ever actually get up to near the speed of light, there would be serious complications regarding “forward sensors” to detect objects that might be in the path of the ship. (The reasons for this reduction in effectiveness are fairly complicated and related to Special Relativity.) And even if such sensors alerted the crew to a planet ahead, there would likely be only a matter of seconds to try to change course to miss it. If that object in the path was a rock the size of a baseball, it would likely be never sensed. If that rock was part of a debris field, like the asteroid belt in our Solar System, there might not be a clear path past all of them. Considering that it took many months to get up to that speed, stopping is NOT an option. Therefore, an impact with a solid rock, with a relative velocity of near the speed of light, would certainly occur. Such an impact is FAR beyond the structural strength of either the rock or any possible construction of the ship. This means that the rock would instantly pierce all the walls through the ship, front to back, the way a rifle bullet penetrates thin objects. Only, this baseball-sized rock is much more massive than a tiny rifle bullet, and it would be moving at 500,000 times as fast! Imagine the damage! All the air of the ship would immediately be lost. The very complex and expensive mission would immediately be over, and probably everyone on board would instantly die. Actually, even a particle the size of a grain of sand would almost certainly blast tiny holes through the ship! You are probably familiar with the nightly flashes of meteors in the sky. They are due to sand-sized particles from space falling into the Earth’s atmosphere at around 20 miles/second speeds. If our ship that had taken the month to get to 15,000 miles/second speed ran into one of these tiny particles, the impact would involve 500,000 times as much kinetic energy of that meteor, since kinetic energy is proportional to the SQUARE of the velocity involved. 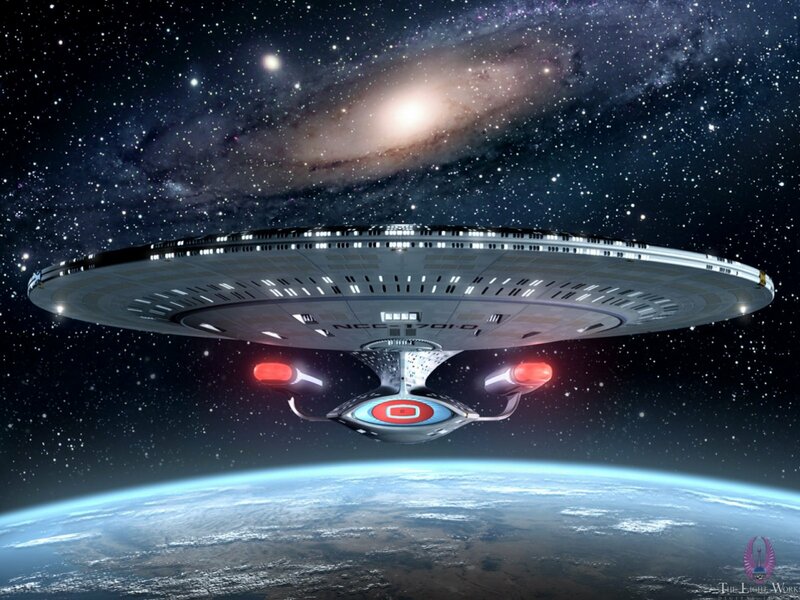 Science fiction stories often refer to “deflectors” that allegedly surround the ship with some energy field to push such things out of the way. There is a problem here! Consider again that baseball-sized rock, and it is up ahead of our spaceship, exactly in our path. Say, for example, it is currently at a distance from us that the Moon is from the Earth, around 240,000 miles. Keep in mind that the Moon is over 2,000 miles in diameter! We would clearly see a Moon-sized object at that distance. But would our sensors ALWAYS see every baseball-sized rock at that same distance? A single failure means that everyone instantly dies! OK! Say we have these awesome sensors, and we see that tiny rock ahead of us. If we are going anywhere near the speed of light, our equipment only has a little over one second to somehow push it aside. Now, that might be possible if it was right here, where we could actually push on it. But remember that it is critically important that we begin pushing it out of the way as soon as we see it, 240,000 miles away. No matter what mechanism you might invent, applying enough sideways acceleration to that object, at that distance, in a little over one second, is just not remotely possible, even with future REALLY advanced technology! For these reasons (and others), it seems VERY unlikely that mankind will ever actually send expeditions to other stars. There is that phenomenon called time dilation that DOES have an effect on this subject. IF the ship could somehow get up REALLY near the speed of light, the passengers within the ship would never know it, but time would pass more slowly for them (from things that Einstein taught us). After experiencing a year of the 2 Gs accelerating to the high speed on the way out, and another year of 2 Gs decelerating to stop to visit, plus the same two years on the way back, plus the actual travel time, yes, this could be in the realm of possibility. A crew traveling in such a way to the nearest star system (Alpha Centauri) might only be 20 years older when they returned to Earth. That means that the crew of an expedition to a relatively nearby star MIGHT still be alive when they would return to the Earth. But, because of the time dilation effect, hundreds of years have passed on the Earth! The people and the governments that SENT them would be long dead and gone! The technology used to send them would certainly have become extremely obsolete during those centuries. On arriving back, the travelers might be treated as heroes, but their collected data would certainly be so primitive as to be a source of humor! What information could they bring back that would have ANY value under those circumstances? What government (on any planet) would initially spend the countless billions of dollars on a project that had such great likelihood of failure, but even if it succeeded, would only have meager results many years after THEY all were dead? Since much of human activity is ego-driven, why would they sponsor such an involved and expensive effort, when THEY could not possibly receive any accolades for success and would certainly be blamed if the crew died during the trip? No way! So, for many technological AND political reasons, we will certainly never send spaceships to the stars. (We WILL certainly someday send manned missions to Mars, and maybe to some asteroids, but probably nowhere else. In astronomical terms, they are relatively nearby) Does this mean that we will never have contact with any alien civilizations, if they exist? Not necessarily! Accepting that a living generation of society and of science could never benefit from such a trip is important. That shifts the ultimate benefit for some future generation’s intellectual growth. Imagine that we take DNA material from a variety of people. We use existing technology to make exact duplicate DNA strings. Then we take one DNA string representing each of these people, and package them together and encapsulate all of it in a tiny capsule. DNA strands are incredibly tiny, and so all this protective capsule could be as small as a grain of sand. We then make million or even billions of such capsules. We load all these countless capsules into a rocket’s payload bay, and launch it at a high enough initial speed so it goes into deep space. Many years ago, the United States launched the Voyager 1 and 2 and the Pioneer 10 and 11 spacecraft into deep space. Now, around 25 years later, they are still only at the outer borders of our Solar System. In 20 more years, they may be completely free of the Sun’s influence. Once out there, imagine the payload bay now intentionally bursting, disbursing the billions of capsules. Each capsule, now in deep space, would then be directed in a slightly different direction. Each would still be traveling “outward” from the Earth and Sun, with the rocket’s original velocity. Over the eons afterwards, they would proceed, gradually spreading apart. Eventually, most of them would probably be gravitationally attracted to some star, and they would be then pulled in and destroyed there. 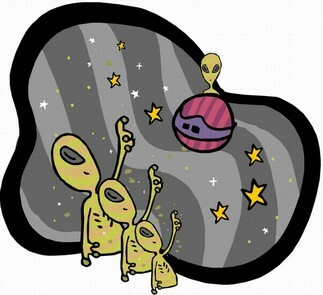 HOWEVER a certain small number of them might eventually be gravitationally be attracted to a PLANET rather than a star! Each capsule would be very small and light. IF that planet had an atmosphere, the capsule would hopefully slow down and not burn up like a meteor in that atmosphere. Ideally, it would float down through such atmosphere like a leaf or a dust grain or even a raindrop, and eventually settle on the surface. What would come next would depend on exactly what we sent out. IF it were just a capsule with DNA strings within it, there would be dependence on some society of the planet to have fairly advanced science and technology. They would have to first find the tiny capsule, and then recognize what it actually was. They would then have to have DNA knowledge and technology (similar to our own) where they would duplicate the DNA strings and implant those strings to enable them to grow living beings from them. The result of THIS would be HUMAN BEINGS on that planet! Possibly, not just on that one planet, but hundreds or even thousands of different planets! The “earthlings” that would then live would then be necessarily in the company of technological people. This would enable the earthling to be able to learn a lifetime of experience from the residents of that planet. But what good would this new knowledge be? Before the DNA strings were placed in the capsules, some changes would be made to an “intron” area of one of those strings. Introns seem to be unnecessary portions of the DNA strings, which might be earlier versions of genes. Changing an intron would apparently have no effect on the eventual creature. The changes made in the intron would be extremely obvious to those researchers that processed the DNA. It might have illogically long sequences of identical links, followed by some coded information somehow describing the Earth’s location. Since the researchers would find this information during the fertilization of an egg, they would have plenty of time to analyze and understand it by the time the earthling was grown. At that time, they would certainly agree to aim a communication laser beam toward Earth with all the information the earthling wanted to pass along back to his original society on Earth! He would never have been on Earth, but he would definitely be an Earthling, and he would contribute toward the knowledge of people on Earth about that one alien civilization! Others like him, on other planets of other stars, would hopefully similarly be sending their personal reports back toward the Earth. No actual “conversation” would really happen. He would never even know if anyone on Earth was actually listening for his report, possibly thousands or millions of years after the original rocket was launched! This whole scenario is already nearly within our capability to initiate. It is also rather inexpensive to do, when compared with the staggering costs of hypothetical inter-stellar spacecraft. It COULD be done any day now! It probably SHOULD be done at some point within the next hundred years, because it is a really logical thing to do. It would ALSO have a benefit of enabling the formation of a future civilization of human earthlings on some other planet, in the event that we manage to destroy ourselves here by war or catastrophic accident or disease. We MUST remember though, that this is a VERY time intensive approach. Our rush, rush, rush attitude just wouldn’t cut it with something like this. Even if a few thousand of our little capsules actually DID float down through some planet’s atmosphere some day, that day is certain to be hundreds or thousands of years in our future. Maybe millions! And then, the capsule is pretty tiny. How long would it be before somebody FOUND it? (Many of them would probably by buried by dirt or fall in an ocean or ???) That could be thousands or millions of years MORE! The point here is that such a project would be for the LOOOOONG haul! Worse, maybe no one was there to find and scientifically analyze our tiny capsules! OK. If this is so exquisitely logical to do, why not believe that some OTHER planet’s civilization has already done this? Maybe millions of years ago? It seems not only possible, but LIKELY! THEREFORE I believe that the MOST LIKELY place to search for evidence of extra-terrestrial life is here on Earth! On the shelves of storage rooms in museums and laboratories all over the Earth, there are countless artifacts that are peculiar. Are any peculiar enough to be or to contain a capsule with DNA strings from some distant, ancient civilization? We already have the technology to check on that. We are on the verge of being able to develop that DNA into a living being! Similar to Jurassic Park’s using preserved dinosaur DNA to cause an actual dinosaur to live today (which is getting VERY close to really being possible! ), this premise would create an alien life form! Actually, several, because our scientists would certainly make duplicate copies, to try several attempts to increase the chance of one actually living. This is such an intriguing idea, that I even wrote the outline of a screenplay of a novel based on the idea. Considering the amazing success of Jurassic Park a similar reality-based story where intelligent alien life forms would be created would seem to be at least as popular! I have been working on that project for several years. There are even more sophisticated versions of this general concept possible. We have been considering the sending out billions of (simple) encapsulated DNA strings, which requires being found and then processed by a relatively advanced group of scientists. What if, instead, we send a capsule that has a shell that will eventually dissolve in an oxygen atmosphere, where humidity or moisture was also present? And then, after the capsule shell dissolved, the contents was not just a DNA string, but some (presently unavailable) technology where the DNA is in a fertilized egg of some sort, with appropriate nutrients included? Essentially, a technological equivalent of an egg? THEN, the process would NOT need the intervention of local intelligent scientists to complete it. The being would be born on its own! OK! This may be pretty difficult to assure for a creature as complex as a human. What if we just sent out earlier genetic versions, like mold spores? Such spores would have a decent chance of surviving and growing on this new planet, even if there had been no previous life there. Given a LOT of assumptions and a REALLY LOT of time, and assuming evolution occurs as science thinks it does, those life forms might eventually evolve into a complex, intelligent life form! Probably not entirely human in appearance, but possibly vaguely similar. If evolution works as is generally believed, that means that the relatively simple task of sending capsules of “germs” like mold spores in our rocket scenario, could eventually result in the development of advanced, intelligent life forms on some remote planet. This approach would not just involve the thousands or millions of years of travel time to such planets, but then possibly billions of years of evolutionary development of those germs/spores. Do you see the exciting possibilities of such a relatively simple project? Since we humans claim to want to ensure the continuity of our kind, and since we seem destined to yet annihilate most or all of us on Earth some day, doesn’t it seem exquisitely logical to launch such a rocket reasonably soon? It may be a billion or two years from now, but sentient beings might live on countless remote planets in the Galaxy, as a direct result of such a launch! They would be “our descendants” in very real ways! Such civilizations might never even figure out where they came from! They might logically conclude that their initial life began as lightning strokes in some primordial ooze! And they would be unlikely to every even know about parallel civilizations on other planets that had a similar initiation, or about our civilization that enabled all of them. Again, if we modified an intron in the DNA of the mold spores (mold spores don’t have many introns!) to have a statistically unlikely sequence, we might be able to embed a description of the location of the Earth and other important information about us. That intron sequence would then be passed along to ALL succeeding creatures (unless damaged by mutations), so that millions or billions of years later, an intelligent self-aware being could recognize that unusual sequence and know where the source of life on his planet actually originated! In the case of us on Earth, I wouldn’t hold my breath on this possibility, but since the Human Genome Project now has documented the sequences of all the sequences in our DNA, it might be worth looking carefully at our introns to see if there is any section that might appear “artificial.” The HGP findings include the fact that only a few per cent of our DNA strings are actually necessary for procreation. That means that the vast majority of our DNA are these apparently non-functional introns. Current research is focusing on the active genes, primarily for future medical benefits. I am suggesting that a serious effort be made at analyzing the introns, to see if any “peculiar” sequence is included. For example, if there was a string of thirty consecutive Guanine links (one of the four possible A, C, G, T), that would be statistically staggering! The chance of such a sequence occurring on its own would be around one in 430 or one chance in a billion billion, not even remotely possible. That would be a statistical guarantee that that sequence was artifically placed there, by an “ancient source civilization”. If such a sequence was found, and similar sequences were found in lower creatures, this might suggest evidence for the original source of life on our planet. It might also explain several instances in Earth’s history where tremendous new diversity of life appeared, (evolutionary bursts) or even the appearance of birds when it is not entirely clear what other existing creatures they are most similar to. If a more recent capsule floated down into our atmosphere from some different planet (where there were a lot of birds) an evolutionary “burst” might not have been necessary. Many of the thoughts of this article, as with all investigations of SETI, are mostly speculation. So few facts actually exist that no cogent presentation can be made without numerous assumptions. As I mentioned in my SETI article, many of the assumptions normally made regarding SETI are clearly incorrect. I believe that this discussion is likely to have much more firm foundation than much of SETI literature, because, as a Physicist, I have tried to base it on scientific principles and physical laws. However, that does not guarantee that my conclusions are correct! I have never seen anyone present this perspective anywhere before. 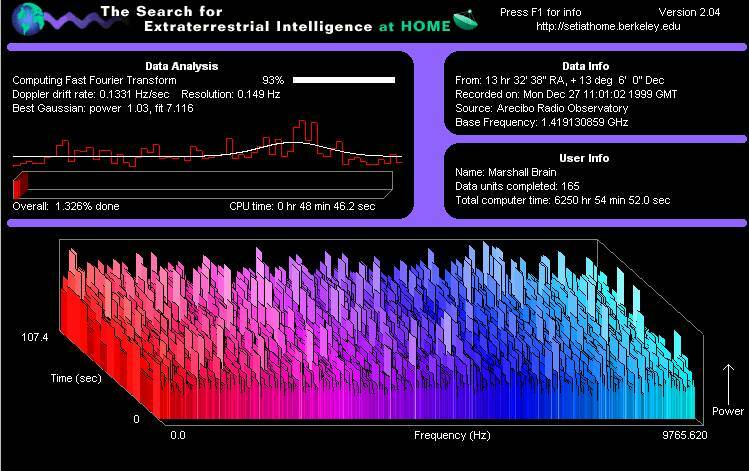 I believe it to be at least as valuable as previous articles and books on the SETI subject, so I hope that is has significant value. It may turn out that, as science learns more, some or all of MY assumptions are incorrect. That’s how science proceeds. A theory is only considered valuable until a better one comes along. It may only BE of value in contributing toward that improved theory. That is my main hope here. The second scenario is going to depend on the likelihood that a longterm evolutionary process will result in intelligent lifeforms, and at present, I think the consensus position is that this likelihood is going to be low. So to be assured of success, we would have send out a huge number of such spore capsules, enough to account for all the improbabilities, from landing on a planet, landing on a planet that can support their growth and survival, surviving the descent, surviving subsequent competition with native lifeforms if present, etc, all the way to evolving into intelligent lifeforms that develop technological civilizations. Also, current understanding on the rates of accumulation of neutral mutations in DNA not subject to selection (like a silent intron sequence) makes it quite likely that no coherent code, artificial or natural, would survive intact, or even in a remotely legible form, for long. If you wanted some coded message to survive for the several billion year evolutionary trajectory that is likely to be required to even have a chance of generating an intelligent lifeform, you would have to put it into a sequence that is subject to stabilizing selection – it would have to be in a gene, and to last a billion years or more it would have to be in an essential housekeeping gene (those are the only sequences on earth that have been preserved for such lengths of time). You would have to design your message sequence such that it not only does not disrupt the function of the gene, but evades elimination by stabilization selection as superfluous. Essentially, your message sequence would have to, most likely, also contribute positively to the actual function of the gene. That is a pretty tall order. right amphiox! This case is intellectualy having great probability. May be aliens are based on completely alien biology. They have no DNA or any such thingy. Thus, it comes out that they couldn’t recognize our DNA capsule. Perhaps, it would be just as healthy capsule for their alien pets. So ok, hey they must have some sort of information messenger which help them in replicating them. They must need encoded information of DNA like thing(actually may not be it DNA or any such thing depending on how alien they are) in order to replicate themselves. This case gives a pretty consensus that if they are sentient and having some sort of technological availability equivalent to us, they probably know that what it is use of? 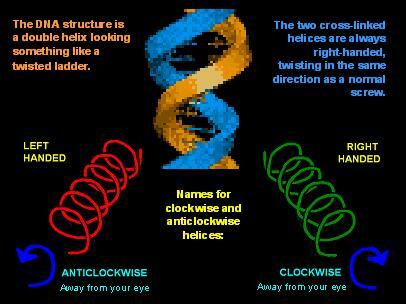 Their alien DNA(encoded information carrier) may or may not replicate depending on their alienness. But my take on that after some time when they would have more biotechnological access probably they would replicate it into alien earthling. If DNA allows such thing to do so for alien tech. A corollary to your theory Bruce would be that if by chance we intercept a radio transmission via SETI radio telescopes and the transmitting civilization sends detailed information on their genetic code and the genetic codes of their planet’s biosphere. We might be able to replicate them using the information. No physical DNA needs to be recovered, only information decoded. Even if we recovered genetic information of alien we could replicate them without any physical DNA. This case scenario is as plausible as gravity. Let’s assume we received a full decoded information(see billions and even trillions of decoded individual information and It’s only possible for very hightech alien civilization to decode it), What’s the possibility that we replicate it? Even when we haven’t decoded our own terrestrial DNA. We’ve just learnt to temper with only one such decoded information or near about. And there is one more thing that it would also be needed to recover alien biochemistry of alien DNA. You don’t think so? There are big complications lying within this idea. Yep, if we own technological accessibility equivalent to those alien brothers, perhaps it is lessened to some extent but still very difficult stuff. Think if you’ve given full information of components and programs of computer and you have to just replicate computer( and remember DNA have millions of times more decoded information than that of those calculating plastic boxes) and you are not to provided components and programs. Would that be easy? Still it remains as possibility that it may be just as easy as making computer for our future tech. Well, thanks for idea, dad2059. Very nice post! Artificial panspermia seems me more probable lurking with the possibility that some aliens had already directed it towards earth billions of years ago. Possibly somewhere in deep sea. Might we found it! Yeah, I am agree with you! If various Transhumanist thinkers are correct about the future evolution of intelligent beings, then it is plausible that non-biological beings could have the capability and inclination to travel between stars. If they are built to withstand the rigors of space, and most importantly, are not limited by lifespan they will be able to travel between stars in their much longer lifetimes. Even without faster spaceships, it may be no big deal if it takes hundreds or even thousands of years to reach nearby star systems. Especially if they have the means to stay entertained during the journey.